Why is a company outranking me for keywords? This question is continually asked time and time again. Why does my competition outrank me for X number of keywords? A lot of business owners will take a look at a couple of key features when analyzing why a company is doing well online. You have probably heard about Domain Authority, Page Authority, link quantity, and MozRank. These metrics are readily apparent and easy to track online. SEOmoz put out a great article that we will reference from Time to Time within this blog. We used an example that was shared by SEOMoz to help relate the following points. The keyword difficulty for the keyword “credit card debt” was a 53 in Australia according to their example, which is rated as “highly competitive”. When you take a look at debtrescue’s it will show a very high ranking in aberration. You can possibly classify this keyword as an anomaly and claim other sites do not make sense based on the metrics either. Either way that is not the case. In fact, the ranking (debtrescue is 2nd on the search, 4th by the keyword tool’s search) yet that domain has the lowest domain authority by over 15 points and the 2nd lowest page authority by over 22 points. With this example they also shared what URl had the most top 10 rankings of the bunch. As you can see from the chart above, this race wasn’t even close. By the stats, debtrescue.com.au really had no business ranking on page 1. So after digesting this information and analyzing all the little details, why doesn’t this website out rank the others? The DA/PA charts on the keyword difficulty clearly states that the site doesn’t rank on based on metrics. 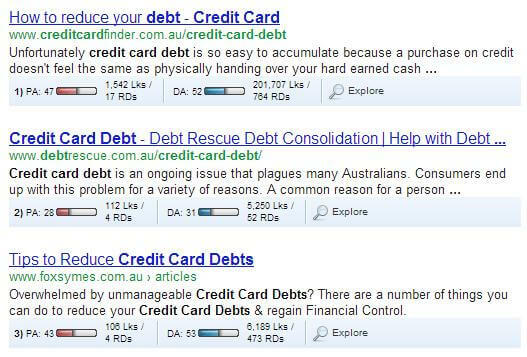 So how did a website like debtrescue outrank anything else on page one? The metrics all say these other sites should be winning handily. Never Get a Straight Answer from an SEO Company? Talk to 100 SEO companies and get 200 different answers. There is no real answer that is going to make you feel comfortable. The truth is, metrics count, but they don’t come close to telling you a concrete answer. Google is getting more advanced and 100’s of influencers affect a ranking. According to the 2011 Search Engine Ranking Factors on SEOMoz, many SEOs think Page Level and Domain Level Link Metrics account for roughly 43% of the algorithm. 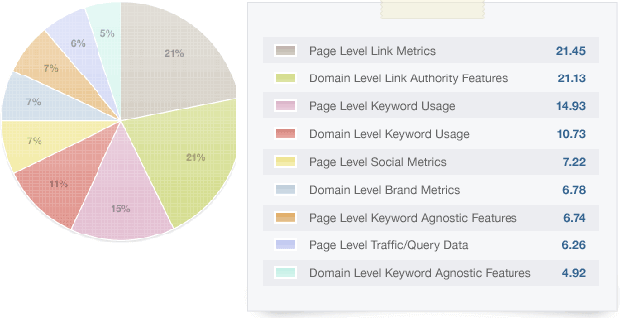 Over half of your total ranking is determined by factors other than Page and Domain link metrics. How your website ranks on Google depends on a ton of different factors other than a few you are continually read about in blogs, forums, and online communities. Pagerank, inbound links, external links, domain authority, tell a compelling story, but will never give you the answer. Truth is that Google will never come out and tell anyone the whole story or in their case the algorithm. It would leave them vulnerable to having poor quality websites ranking on the web which would devalue the value proposition of the organization. But we can share with you what we do know. Here is what we know: The penalties were enforced to stop spamming. Content was once king and that strategy got abused. Linking strategy was once the answer, then it got dethroned, and now it is a combination of both. You have to have a unique combination of fresh new content, show an effort to stay modernized, proactively share your information, generate a buzz, and organically gather links back. Data Matters: Google tracks certain data. Google tracks data it finds relevant and reliable. So what can you find in Analytics and with a bit of testing? Time onsite matters. One of the biggest suggestions we can make to enhance your SEO is to increase the quality score of your website. This metric tells Google that someone found your page and enjoyed it enough to stay on your site longer than your competitors. We believe that the duration of a visit is a direct parallel of the websites overall quality and usefulness. Pages Visited matter. This goes back to the time onsite theory above. If an end user searches for a specific keyword and visits just one page on the #1 site, then seconds later goes to the #2 listing and spends 15 minutes, what do you think that tells Google? Algorithmic and manual penalties matter. If you put that keyword fifty times on your page, as we discussed above, you will run into an algorithmic penalty. This means Google knows you have “stuffed” the page and will take a bit off your ranking. Do it repeatedly and you’ll get a much larger penalty. If a Google manual reviewer catches you doing this, or a competitor reports you for it, you may get a manual penalty. You will get a notification in your Webmasters Tools about this one and you do need to fix it or suffer a harsh penalty. Social Integration- Depending on what SEO Company you talk to they will tell you that social metrics matter very little. We have found that every quarter social metrics are influencing rankings more and more. If you get 2 or 3 retweets on your links, it won’t help you very much, just like adding one backlink. However if you get 200 retweets to that same link, which was shared 50 times, and pinned 8 times, now you’re talking. That will influence a ranking. The Text of the Link still Matter. Hurts to hear if you have just been penalized, so don’t misunderstand this section. Anchor texts can be positive and negative. If you over-optimize a handful of keywords, it will hurt your rankings. It is all about balance, if you have the right combination and variety you will see your organic rankings improve. 301 redirects matter. You just redesigned your site and you got ride a lot of content, created new landing pages, but forgot to 301 your existing content to your new pages. This stuff matters. When you are spying on your competitors and they show poor SEO metrics, reality is they might have great metrics, just with another site. They may have changed domains and redirected all those rankings over to a new site. Search Engine Marketing is a great way to enhance your online marketing presence, but there are a ton of factors that go into converting a website to the top of the search engine. What was once an easy process has morphed into a complex strategy that involves different skill sets to perform different tasks. The day’s where throwing up a cookie cutter website with cheap SEO is extinct. Small SEO companies can’t compete, while smaller mom and pop companies have to wrap there head around the fact that online marketing is a bigger investment than they are used to.